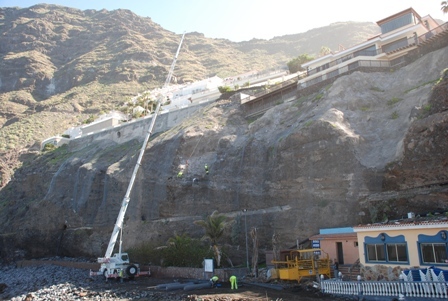 The work on Los Gigantes beach is going ahead at a good pace. The huge rolls of wire meshing, which have been shipped in from Santander from the mainland are currently being crane lifted, unrolled and pinned into position. Los Gigantes beach, where two women were killed over a year ago by falling rocks, is due to reopen in the spring once work to make it safe is completed. Santiago del Teide council has awarded the tender for the work, which is expected to start in early January and last two and a half months, at a cost of 600,000 euros. The bulk of the project involves shoring up the rock face by injecting concrete and giant nails and then covering the face with steel netting to prevent dislodgements. Improvements will me also made to the lighting and the nearby toilets. On December 2nd another small rock fall led to the partial closing of the street leading to the beach. The landslide, at around 3pm, was reported to the police who apparently. Mayor Gorrín had ordered the total closure of the road. But it seems someone in authority later relented under the pressure from residents and retailers and instead ordered a partial closure of the road. 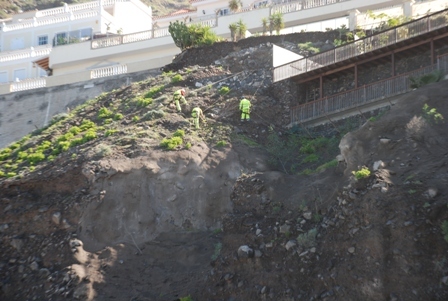 A council spokesman said that the water channel in the cliff was on the move again and it was that which was responsible for this latest landslide, which saw small rocks falling into the street. 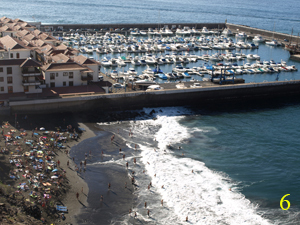 In a surprising new development, the Mayor of Santiago del Teide has changed his statement regarding the warning tape on the beach at Los Gigantes. Immediately after the tragic events of Sunday November 1st, Mayor Gorrín appeared adamant, in statements made to the media that the area where the massive rock fall occurred, had been cordoned off. Now, in testimony given at the official Guardia Civil enquiry, taking place at District Court Number Three, in Arona, Mayor Gorrín has done a complete about-turn. The mayor said he had also been informed of the smaller rock fall, which took place on October 2, by the local chief of police. Gorrín said he was told that the area had, at that time, been provisionally cordoned off with plastic warning tape attached to steel poles. Mayor Gorrín also told the court that at no time did the Department of Coasts, or experts from the municipal engineering department, recommend closing the beach prior to the accident. According to the mayor`s testimony, he was advised by the councillor responsible three days later that a more permanent warning had been put in place. 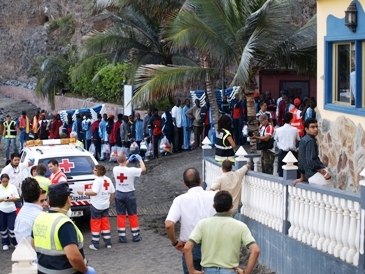 63 illegal immigrants arrive on Los Gigantes beach. 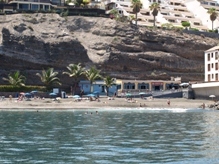 Los Gigantes beach is normally a happy scene of tourists and locals alike enjoying the sun, sea and sand in the quiet bay. At approximately 8am this morning (Tues 16th Sept 2008) it was a totally different scene, it became the latest one of the archipelago beaches to be landfall for a patera. 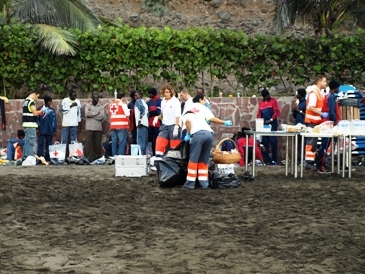 The authorities swung into action to provide the humanitarian care with first aid, water, food and clothing provided from the Council and the Red Cross. 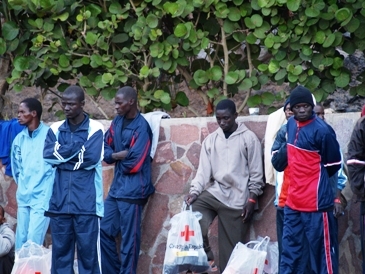 A heavy police and Guardia Civil presence ensured the 63 immigrants remained contained on the beach. One immigrant was taken to hospital for an emergency operation and several others were treated by the Red Cross for minor injuries. The boat people are the usual mix of young to middle aged men. This group can count themselves lucky as many die on the crossing and had they not made landfall here they would have undoubtedly ended up in the trade winds and currents which flow from here to the Caribbean. It shows once again that no matter how vigilant the authorities are these boats still slip past the control net. It has to be said that on every occasion when we have been involved in the filming of this human crisis the authorities here have acted with great compassion and professionalism. The Ministry of Environment is planning the dredging of more than four million cubic meters of sand from the seabed of Tenerife for the regeneration of various beaches on the island. The five beaches where sand will be dredged are Punta de Anaga (655,905 cubic meters), Antequera (573,975 cubic meters), Punta de Abona-El Médano (896,062 cubic metres of marine sand), El Sauzal (1,345,225 meters cubic) and Los Gigantes (776,060 cubic meters).